This tasty sandwich gets a robust and rustic twist with the simple step of charring the tomatoes. Heat oil in large skillet on medium-high heat. Add tomatoes; cook 4 min. or until lightly charred, stirring occasionally and adding garlic for the last minute. Sprinkle with thyme. 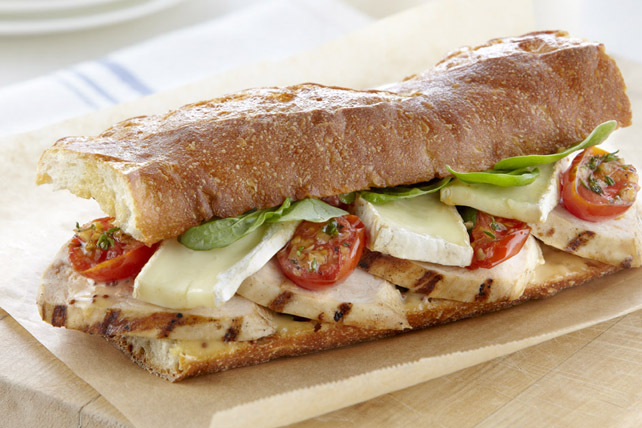 Spread bottom half of baguette with sauce; top with chicken, tomato mixture, cheese and spinach. Cover with top of baguette. Cut into 4 pieces. Substitute chopped fresh parsley, basil or chives for the thyme. While charring the tomatoes before adding them to the sandwich adds great flavour, you can also prepare this tasty sandwich using uncooked cherry tomato halves.